Nitrogen gas springs use compressed nitrogen gas to exert force. Housed within a cylinder, our Nitrogen gas springs meet a wide variety of specifications, with variations on tonnage, stroke lengths, and mounting capabilities. They are used in automobile struts and hatchback doors, office chairs, press tooling, medical and aerospace applications, and other industrial manufacturing. 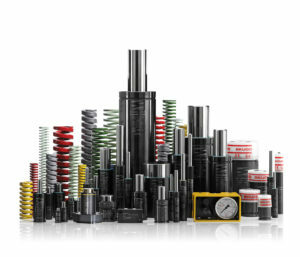 At Precision Punch we offer a full-line of nitrogen gas springs, from standard and fixed height cylinders to auto-return cylinders with height adjustment. The structural components of Special Springs’ gas springs are designed and built to withstand a minimum of 2,000,000 complete cycles at maximum pressure, temperature and for all types of fixings. We also offer a full line of Wire Die Springs.